Steel is said to be the most versatile and the toughest variety of metallic alloy of iron, carbon, manganese, oxygen, phosphorus and silicon. The solidity and sturdiness of steel is due to its carbon content. Steel plays a significant part in our everyday lives. Because of steel, we are all enjoying the benefits of various machines, tools, and other products made of steel. Our homes need steel to serve as its overall framework. Buildings, bridges and electrical devices or appliances also make use of steel. Various kinds of tools and equipment and also the kitchen utensils and garden tools we use everyday are also made of steel. Aside from that, steel is also useful in the creation of weapons used by the military, pipelines, etc. In fact, steel structures are very important in the society for they make up the vital tools and structures that we need to survive in this world. In view of that, the steel industry serves as the most important support structure of every method and development of industrialization. You see, it is impossible to achieve progress without using a sturdy and durable iron and steel in the fabrication industry. Steel has specific features that make it very important and very valuable in diverse industries and businesses. You might be wondering how steel structures were made. Well, the answer to this is the method of fabrication. When you say metal fabrication, it refers to the process of cutting, forming, bending, and shaping the metal components to manufacture different metal items and structures. By means of this process, the steel fabricators are able to manufacture metal sheets, plates, and pipes by molding the steel bar or steel rod into various shapes and weld them altogether to come up with a final product. It is also in this process in which the steel fabricators are required to use machines for fabrication such as laser cutters in order to perform various metal works. But you must understand that the designs and blueprints of the steel structures or equipment are made by the so-called structural engineers. But the final product is produced by the steel fabricators. In view of that, the main responsibility of the steel fabricators is to convert the blueprints into a functional end product. The first thing that they do is to modify the shape of the raw material by means of specialized fabrication tools and equipment so as to create structural frames and support. Then, they chop down the materials according to the sizes that are required in the production. After cutting the raw materials, the different metal parts are fastened together by means of welding. This is necessary to create the final metal structure or product. Lastly, the end product is brought by the steel fabricators to the final processing which includes sand blasting, finishing, and painting in order to make it all set for release and delivery. If you will look at it closely, the steel metal fabrication method is utilized in many different kinds of industries, particularly those who involve the use of metal and steel. For this reason, these industries need a metal fabricator in order to help them with their projects. Basically, steel metal fabricators are in charge of manufacturing steel parts that can be utilized for steel structures, machines, and other products. In that case, the steel metal fabricators should possess outstanding skills especially in soldering and welding. It is also an added bonus if the steel metal fabricators are skilled at science as well as math. This is in view of the fact that the nature of work usually entails heavy lifting and long hours of work. No wonder physical fitness is definitely a must for those who would like to become steel metal worker. If you need some help in small to large scale metal artworks or projects, MFGpartners.net is here to provide various custom metal fabrication services to correspond to your specific needs. Although the job functions of metal fabricators may differ according to a certain industry, you can be sure to achieve desirable final metal products when you entrust your projects to MFGpartners.net. 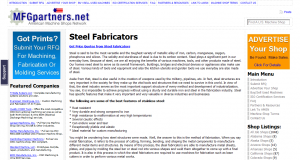 In MFGpartners.net, steel metal fabrication is not a problem. Their steel metal fabricators are adept in working with a wide range of tools and machines to set up metals for alteration or welding and to transform various raw materials into very functional metal components to produce a highly durable and sturdy steel structure and framework. The final steel products are usually created as son as the raw steel materials are handed over to the steel metal fabricators. Then the fabricators will make use of high end machines and tools to manufacture the metal parts in accordance with the specifications of the client or industry. Also, computer-operated machines are essential in order to com up with precise cuts by means of cutting tools, rotating tools and also laser devices. In the case of construction industries, the steel metal fabricators are using welding tools and machineries to join the steel components together. We all know that the welding process in metal fabrication is somewhat complex and unsafe. Because of this, the steel metal fabricators are required to go through general training so as to turn into a professional fabricator or steel worker. More often than not, apprenticeships are important for the fabricator to become skilled at the correct techniques and methods of metal fabrication. So, if you will be working on a very important project, make sure that you rely on the trusted provider of custom metal fabrication services. With www.MFGpartners.net, there are several metal fabrication services that you can avail of aside from the all-inclusive support and assistance of the company’s top-notch steel metal fabricators in the industry.